The OME-DB-24SSR includes 24 normally open, or Form A, solid-state relays. The board interfaces to field logic signals, eliminating ground-loop problems and isolating the host computer from damaging voltages. The user can use the OME-DB-24SSR to switch high voltage loads up to 240 Vac and up to 4 A. 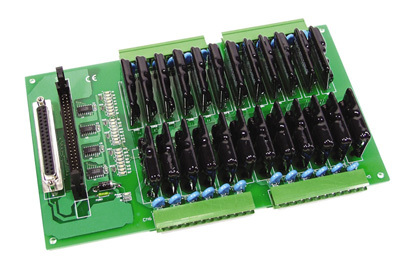 The relay is energized by applying a 5 V signal to the appropriate relay channel on the 50-pin OPTO-22 compatible connector or 37-pin D-Sub connector. Twenty-four enunciator LEDs, one for each relay, light when their associated relay is activated. Because there is a D-Sub 37-pin connector on the board, the user may use it to interface to any TTL output board. Each board is supplied with complete operator's manual on CD ROM.